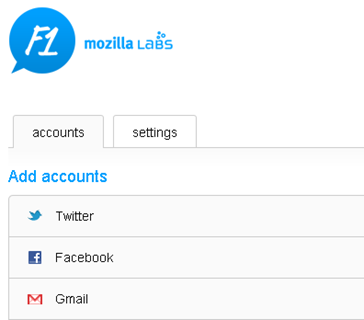 I am a huge fan of software from Mozilla Labs – Firefox being one the graduates from there. They also brought out several interesting ones like Mozilla Prism, Ubiquity, Firefox Sync, BeSpin, etc. F1 is a new social sharing Firefox extension. Once installed, it makes it easy to share web links and content via Twitter, Facebook, Gmail, Google Apps, Yahoo Mail, etc. If the name F1 has you wondering if it is related to Formula 1, no it is not. You access the sharing service by pressing the F1 key when in Firefox. Hence, the name F1. Once you configure and authenticate the services you want to share links with, just hit F1 while surfing to share content. It’s as easy as pie. If you are on certain keyboard configuration where the F1 key may not be the best to use, you can disable that in the settings. You can just use the Share button in your Firefox toolbar. While in settings, you can also configure to bookmark all the links you share with F1. You can find these bookmarks as unsorted and can all also search with keyword F1. I have installed F1 in my Firefox and starting to use it regularly and really like it. I would like to see more services added to it. Don’t forget to check out the best Firefox extensions list I have put up.